It is common fare for people like me to point disapprovingly to the revolving door between business and government, which ensures that every Treasury Department is well stocked with representatives of Goldman Sachs. 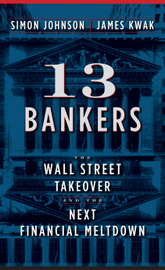 In 13 Bankers, the revolving door was one of the three major channels through which the financial sector influenced government policy, alongside campaign contributions and the ideology of finance. The counterargument comes in various forms: people like Robert Rubin and Henry Paulson are dedicated civil servants who wouldn’t favor their firms or their industries, the government needs people with appropriate industry experience, etc. 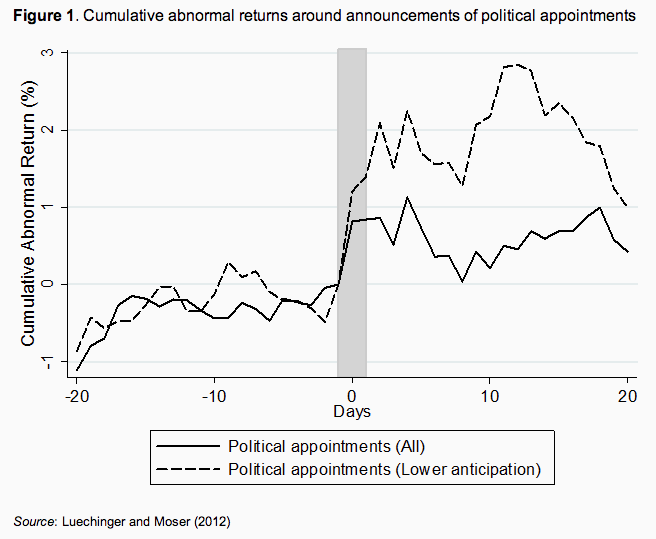 Luechinger and Moser survey the existing literature on the value of political connections in the first part of their paper. To summarize, this is the kind of thing that you expect to find in developing countries and countries with weak institutions—not in the United States, the paragon of democracy and the greatness we never weren’t. The disproportionate influence of economic elites on political decision-making is a hallmark of emerging market crises; its importance in the United States during the financial crisis was a central theme of “The Quiet Coup” and 13 Bankers. Luechinger and Moser provide a little more evidence that we are a bit more like Indonesia of Suharto than we might care to admit. This entry was posted in External perspectives and tagged politics, regulatory capture. Bookmark the permalink. Yes they do, just make certain the door doesn’t close in on you. How do you respond to alternative explanations such as, “Ms. X is the best in her field. That’s why she was working at the highest levels in government and why bringing her genius and fantastic skills to Company will result in increased profits”? Or, to go in the other direction, “Gary Gensler understands the way commodities are traded, and that’s why he made himself a mint at Goldman. But he cares about more than making money and realized that he could feel better about himself by becoming a strong regulator than by making more money or just relaxing on his laurels and wealth”? I don’t dispute that people are hired for their connections — happens business-to-business, too, but we should have higher standards for government workers — and abuse them in both directions, but I don’t understand how you (singular and plural) can be so confident that this is the majority, let alone feel comfortable assigning it as the reason behind a specific spin of the revolving door. For which there is only ersatz evidence. The reality is that the ‘poor’ have never had it so good. They live in better housing, have better clothing, and eat more than in any other time in our history. Like FDR naming Joe Kennedy to head the SEC? But, really, do you believe your own arguments? Should we staff Treasury and all other agencies with Americans whose names have been drawn at random? You apparently haven’t walked the streets of Detroit, Michigan recently. The poor in America DON”T HAVE it so good, not by a long shot. @Bond Man – When you look at Detroit’s 2 most famous Rethug “sons” – Mitt Romney and Erik Prince of Blackwater, just those 2 are making sure that the *poor* in Detroit are in sync with “global” metrics – like Namibia, for instance, where people have not yet invented pots and pans with which to cook their food – they just throw the egg directly in the fire on the ground (A “No Reservations” TV show segment – very interesting, you should check it out.). Lively thoughts…and you and you readers are some of the few who are both informed…and accepting of truth in spite of cognitive dissonance. WE are about to see many things happen in the near future: Obviously, economic collapse, then the US and world realize that 911 was a crime…not an attack…and finally our citizenry will accept that our democracy has morphed into a hybred Facism / Oligarchy …corpotocracy, whatever you call it, and the light at the end of the tunnel? That the current Duopoly will be thrown out, legislation will address the foundational problem from which our ills ail: corruption. Corruption, is the only problem and the plethora of things we call problems…are merely symptoms of this singular problem. Ten laws, can both excise it and prevent it, as we find our way to a resource based economy and leave the folly of speculative capitalism behind. Tag!